One thing that pleasantly surprised me about Astoria was the plethora of butchers and fish shops around the turn of every corner. It's a food wonderland at your disposal. (Not to mention the fruit and vegetable stand right below my apartment. Can you get more convenient?) Just on my walk to the post office the other day, I encountered three fish markets. One of our first Greek restaurant experiences after the move to Astoria was a restaurant where I was forced to choose between sensible shrimp or the boldness of sardines. I'd always heard fresh sardines were worthy of a try but shrimp was safer. I've regretted passing up the sardines ever since because it was so uncharacteristic of me to make the safe menu selection. How disappointing of me. There's no better way to remedy this than to return home from the fish market with a mass of mussels and sardines for dinner. There's not much on the Internet in the way of sardine recipes or in any of my cookbooks, except in Mark Bittman's "How to Cook Everything," a book I am generally so-so on. 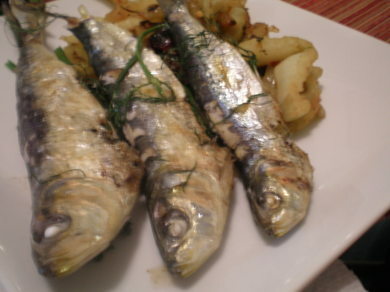 The book informed me that sardines are a popular appetizer throughout Europe and that in the United States, sardines are usually sold "gutted with their heads on." Wrong. Granted, it was my fault for assuming this was so and not even thoroughly inspecting them in the fish market. Lucky for me (I think...), the book also provided a rough guideline to gutting the things, and Ryan agreed to help. How romantic to gut fish together, considering it was Valentine's Day. So Ryan took my kitchen shears to cut through the belly of the fish and I pulled all the guts out. Despite all my complaining, it wasn't so bad of a task except that it's a tiny bit disgusting, and I was sorry the process had to be repeated 12 times. Why had I gotten so many sardines again? And it never ended. Each one had to be washed, scaled, stuffed with herbs and slathered with butter. I was getting mighty sick of those sardines and it wasn't even time to eat. Then they pop into the broiler for 3 minutes on each side. After all our hard work, it was time to enjoy those sardines. It's really remarkable how many bones are in them. So much so that one sardine yields maybe two baby bites of unboned fish. But you chew those paranoid still of more bones. Bones, bones, and more bones. We finally just gave up. Ryan thinks lobster isn't worth the effort it yields, which I disagree with. But these really weren't worth the effort. 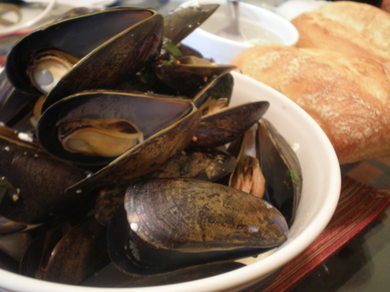 Fortunately, I had also sauteed fennel and steamed mussels, which were both a smashing success. So two out of three isn't bad. Plus, I could have made a whole meal from the mussels and bread so we didn't even miss the sardines. The mussels were quick and easy.. And not too bad to clean, considering how much time I put into the sardines. I just soaked the mussels in water for an hour or so and then trimmed off the beard with my kitchen shears (My kitchen shears really got a work out that day.). The mussels were cooked with some white wine, herbs and a pat of butter in a pan with a lid over them for about seven minutes. The whole process was quick, easy and deliriously delicious. It was the opposite of the sardine fiasco. So skip any fresh sardine fantasy you may have and go straight for the mussels. You have that half portion of leftover pasta that you have no idea how to recycle?? It's not enough for another meal and you could just slurp it up cold from the fridge, but why not recycle it into a whole new meal? 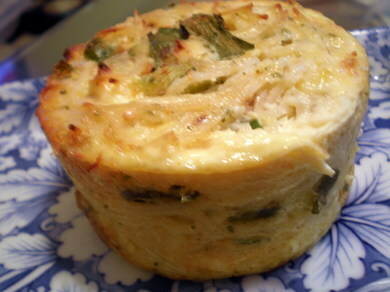 Just look at my mini pasta frittata -- who would ever know it was put together using leftovers? So much in your fridge is worthy of some leftover love -- Almost any meat or vegetable can be slid into an omelet; vegetables like peas or potatoes can be mashed and fried into a "pancake;' and almost anything can be mixed with eggs for a frittata -- including pasta. Serve with a salad for a quick, easy meal reusing those leftovers. I love S'mores. But why do I have to wait for the grill-time of summer or the very occasional camp time trip to enjoy the marshmallowy mess? 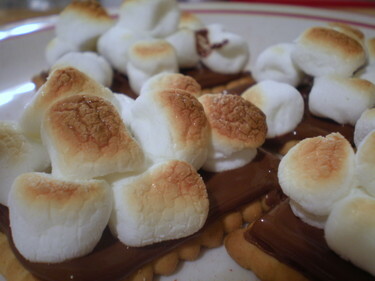 I've found an easy way to get quick S'mores at home that rival any you'll get over a campfire. Le Petite Ecolier cookies are the start. These butter cookies are coated with a chocolate top (I like the dark chocolate version). This makes an easy process almost easier. I find the Hershey bars are too thick and are never fully melted by the time the marshmallows are ready. With the Le Petite Ecoliers, the amount of chocolate is a perfect ratio to the marshmallows and cookie. First of all -- I don't own a microwave. In the beginning, it was almost a test to see how long Ryan and I could make do without a microwave. And where would we even put it if we had it? It's been more than three months and I only miss it to reheat leftovers (especially pasta). So the s'mores microwave option I used as a child was out. But the broiler? Why not? And guess what? It was perfect in that it yielded melted yet slightly charred marshmallows. I only had the miniature marshmallows so I stacked them all on the cookies and then on a cookie sheet to go under the broiler. Check on them every 30 seconds. Mine were toasty after almost a minute. Keep your eye on them because like anything under the broiler, things burn at a rapid rate. 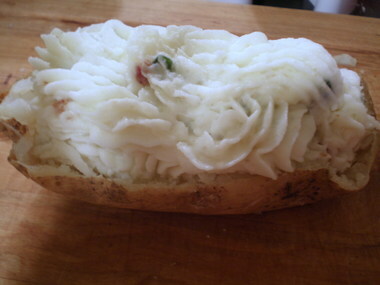 The twice-baked potato prior to the accident. We all gathered over at Ryan's friend Brad's Monday night to watch the National Championship game. Since Auburn is in the SEC, I had to root for LSU and continue the SEC pride (sorry, Jenny!). It didn't matter that the game was pretty lopsided, we had our own little excitement with some hot potatoes. Brad was making the chicken, veggies and salad. My contribution -- which will go down in history -- were twice-baked potatoes filled with scallions, bacon and blue cheese. They were in the oven getting crispy on the top when Brad took the potatoes out of the oven to use the cookie sheet they rested on. Lesson no. 1: Don't use a wet towel to take anything out of the oven. Water conducts heat and it's like touching the cookie sheet with your hand. So the potatoes dropped everywhere. Bye, bye potatoes. Brad kept apologizing and apologizing when he should have been focusing more on the hot mess of potatoes that had landed on his sandaled foot. Bringing us to.. Lesson no. 2: Make sure your feet are covered when you're working in the kitchen. You know.. they drill his lesson into you in culinary school but I had never seen it in action (probably because all our feet were covered). Hot potatoes are hard to fling off a foot, for the record. Those babies -- in all their 350 degree glory -- were on his foot a good ten seconds. This didn't do so well for Brad's foot. When I cook at home, in flip flops no less, I always worry that a knife will fall on my foot, never thinking about the hot food that could. And Lesson No. 3: Don't bring hot food to someone's house. You'll feel really guilty when it lands them in the emergency room with second degree burns. I saved one potato because it couldn't fit in the container to Brad's, which Ryan and I ate yesterday, along with a little guilt. rack in the center of the oven and bake for an hour. Check doneness by inserting knife in potato. Cook longer if not done. Remove from oven and let sit 5 to 10 minutes to cool. Cut potatoes in half lengthwise and (using a towel or potholder), scoop the insides into a bowl. Be gentle so the skin is still intact. Add butter and mash potatoes with fork or potato masher. Add milk, sour cream, salt and pepper. (If you like a thinner consistency, add more sour cream or milk.) Add scallions, bacon, blue cheese. Taste and adjust seasonings. Refill potato shells with mashed potato mixture. (NOTE: I like to overfill my potato shells. So even though six potatoes yields 12 potato shells, I only use about 8 of them. Use the extra for potato skins.) Bake in 350 degree oven 25 minutes. 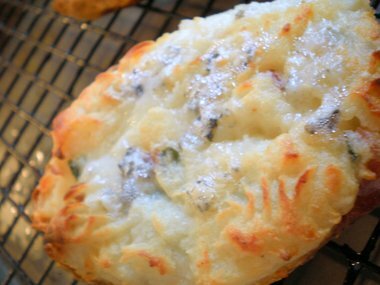 Sprinkle with reserved blue cheese and cook 5 more minutes. Am I the last person to finally get a bite of a Five Guys' burger? I was waiting for the lines in NYC to die down before a visit to the hamburger mecca. So when we were in Alabama visiting my family, we trekked to Huntsville to visit friends. There was a Five Guys. But, oh no, we had to wait for the NYC one. Plus, we had other culinary adventures on our list like bbq, Chick-fil-A and Sonic (funny the things you miss!). I tell my friend Michelle how we're visiting Five Guys. "Oh, we have one in Atlanta," she replies. The walls of the restaurants (and cups) are plastered with accolades from publications in numerous cities like Philly and D.C.
We went on Sunday for lunch and the restaurant was practically empty when we entered. First of all, the burger goes down as probably one of the messiest I've eaten as I have five dirty napkins to show for it. I got "the regular" cheeseburger which has sauteed mushrooms and onions, along with tomatoes, lettuce and pickles. I added jalapenos. Big mistake. Those babies were thick and beyond hot. I can handle a jalapeno but this was too much to compete with my regular sized soda (This was before I realized refills are free.). The burger was good.. Okay, very good. I especially liked the way the cheese is smothered between two beef patties. And the sauteed onions are a nice touch. Plus, the Cajun fries rocked. 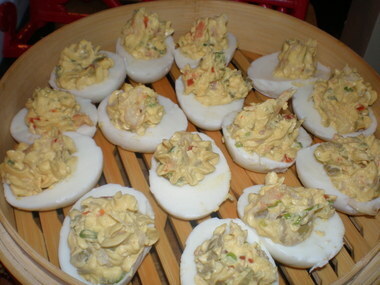 Crispy on the edges, nice and soft in the middle with an excellent Cajun spice. 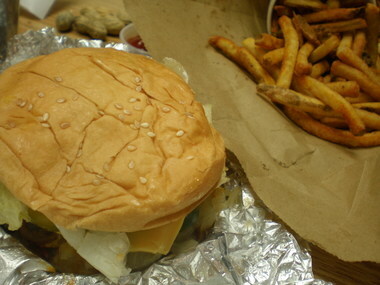 But in the end, I think Five Guys is just the East Coast's answer to In & Out Burger (with superior fries!). It's a good fast food burger, when you're craving it. And it's massive. I think I like it's smaller, fattier and more flavorful counterpart at Shake Shack. But I could be tempted into smuggling those fries in to eat with my Shake Shack burger (or at least on the way to Shake Shack). -- My friends, Melanie and Craig, hosted a bbq tasting at their house. I've never had the option to dunk my meat into so many sauces. The winner -- Big Bob Gibson's Red Sauce, followed closely behind Big Bob Gibson's White Sauce. And, no, Big Bob Gibson did not pay me. The red sauce was a perfect harmony of tanginess, sweet and robust tomatoes. And the white sauce was reminiscent of Miracle Whip. But not in a bad way. Just that hint of Miracle Whip that I remember so fondly from my great aunt's sandwiches. 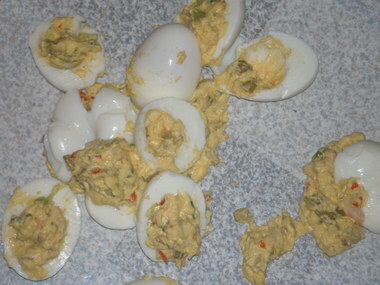 -- Deviled eggs don't survive well in a fall. --And when all else fails, pull out a Paula Deen recipe. 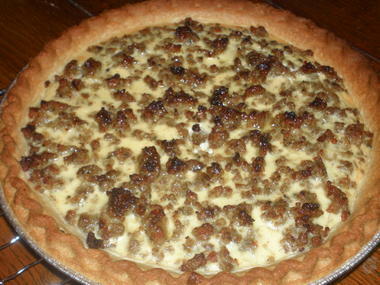 My mom made this sausage pie on Christmas Day. I, along with everyone else, was addicted to it. She had pulled it off a community board, who referenced the recipe from the Food Network. I looked it up, only to find it was originally a Paula Deen recipe. Of course it would be. Who else would be endorsing sausage, cream cheese and pastry? Yes, yes. Turnips. Even the name doesn't sound so appealing. But I like all root vegetables, so why not turnips? Usually I just toss them into the mix when I'm roasting vegetables. And having a bite of turnip amid carrots, potatoes and parsnips is fine by me. But this time, I decided to try them on their own. Besides, Ryan wasn't even sure he had eaten a turnip before so we had to change that. Of the 138 recipe results that turned up for turnips on epicurious.com, a majority were 1) mashed or 2) au gratin. That's all fine and well but -- gasp -- I wasn't in the mood for a creamy turnip production. I wanted to taste the turnips in their own glory. And Gourmet's Turnips with Breadcrumbs from '94 fit the bill. Par-cook the turnips and then cut into wedges. 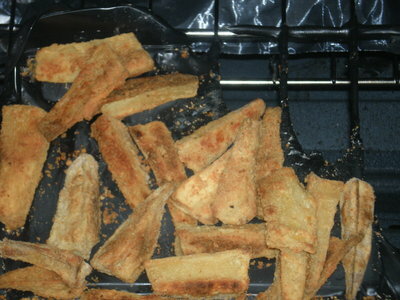 (I cut into wedges first and then par-cooked. So there, Gourmet). Toss them into a skillet with butter and brown a bit. As you can see from the picture, I didn't do that step so well. Sometimes I'm impatient and hungry, and I don't want to wait for a little browning. Then I tossed in parsley, lemon zest, salt, pepper and panko instead of breadcrumbs. Well, I can't say I was so thrilled with the dish upon the first bite. But not so much that I didn't continue eating. But an odd thing happened -- the more I ate the turnips and got accustomed to the flavor, the more I really liked it. By the next day, I was fighting Ryan for the last of the turnips. Well, not really. He was glad to let me have them. I'll put turnips in the "acquired taste" category. But if you do like them, this is a nice refreshing recipe. In a large saucepan of salted boiling water, cook turnips 15 minutes and drain. When turnips are cool enough to handle, cut into 8 wedges. In a large skillet cook turnips in butter over moderate heat, stirring occasionally, until almost tender and golden on the edges, about 10 minutes. 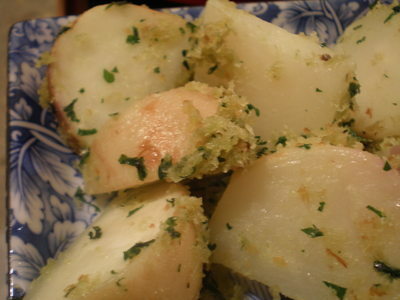 Stir in bread crumbs, parsley, zest, and salt and pepper to taste and cook, stirring occasionally, until turnips are tender, about 5 minutes. So you know those Glad OvenWear containers.. Sounds too good to be true that these trusty black plastic containers can withstand the heat of the oven, right? I've always been wary. But their whole name -- OvenWear -- implies they are oven safe. I was reheating parsnips coated in Parmesan cheese (a very good Delia recipe) when suddenly the whole apartment began to smell like burning plastic. I should have known better than to trust them. It took two days of scrubbing my oven to get rid of every bit of melted black plastic pieces. And, of course, the oven's brand new so I feel bad destroying it in such a manner so early on. I visited the Glad Wear website to discover that they advice placing the OvenWear container on a sheet tray in an oven during use. Did I miss those instructions on the container? At least now I know. Whew.. The NaBloPoMo is finished. All in all, it was a good challenge to make myself write even a little each day. So I'd recommend it. But I'm glad the daily looming "must post by midnight" is finished. Anyway, last night I made Daniel Boulud's Kimchi recipe from his cookbook, "Braise." I love love love the cookbook. Some of the recipes are time-consuming prep-wise but usually well worth it in the end. This may be the one exception. Kimchi is a fermented dish from vegs (usually cabbage) with varied seasonings. Well, Boulud takes cabbage and has you braise it in a spicy liquid instead of fermenting it. First, you salt the cabbage and have it sit for hours. Then, you dice pears, bell peppers, scallions, ginger, etc. which is what makes it so time-consuming. And in the end.. I'd rather just buy kimchi. The braised kimchi is good but not good enough to make the day long cooking process worth it. I have a huge batch of this in the fridge and there's no way it'll be eaten before its demise. The little jars of kimchi that I can get as the Asian store are much better and last longer. Oh, well. Anyone want to come over for some homemade kimchi? I've been experimenting with wonton wrappers in a non-Asian capacity. I used them for lamb ravioli so I didn't have to mess with pasta dough. I took leftover braised lamb, pureed it and stuffed it into the wrappers. I cooked the ravioli in boiling water a few minutes before tossing them into a brown butter sauce. The ravioli were delicious, although very, very delicate. 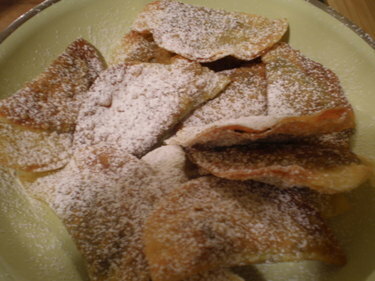 But I wasn't finished.. For dessert, I put a dollop of Nutella into a wonton wrapper and fried it. The crunchiness of the fried wrapper is a perfect match for the warm chocolate hazelnut ooze. Here's what ya do -- Spoon a teaspoon of Nutella into the wonton wrapper and fold one side over the other. (You almost want to put more in it, but one teaspoon is perfect.) Seal the edges with water so no Nutella leaks out. Put a half an inch of canola oil in a saute pan and put to medium-high heat. When the Nutella "dumplings" brown, turn them over. It only takes a couple minutes to puff and brown on each side. Drain on paper towels and sprinkle with powdered sugar. In the words of Rachael Ray (who I still hate), "delish." For some other ideas of what to do with wonton wrappers, take a look at this chowhound thread, which lists numerous uses like mini-quiche holders and mini tacos.